Love animals? Looking for outdoor ventures? 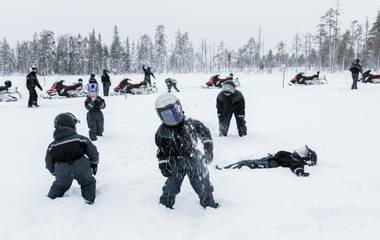 Our family holidays to Ranua transport you to Finland’s wild side with visits to Northern Europe’s top place for seeing Arctic fauna, all with a sprinkling of the finest winter activities! 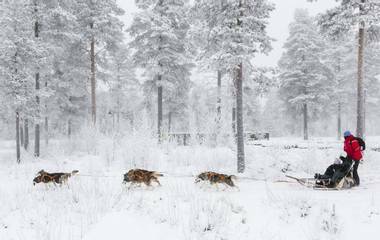 Sat at the bottom of Finnish Lapland, Ranua Wildlife Park is a world-class destination with around 50 species in carefully designed enclosures which closely match the settings of natural habitats. Moose and wolverines, otters and lynx, eagles and owls – the list goes on, and you’ll have so many to see. No trip to Ranua would be complete without meeting the regal polar bears: an unmistakeable park highlight! You’ll be staying at the modern Gulo Gulo Holiday Village: an excellent family base of stylish apartments with all amenities, including a personal sauna and open decking area. Its central position means that most other activities start on site, so you won’t have to take lengthy transfers: fun is right outside your accommodation door! Depending on which itinerary you select, you could be cross-country skiing, snowmobiling, or snowshoeing, to name but a few; pick one of our Christmas holidays to Ranua and you’ll also take part in festive fun before saying hello to Santa Claus! There’s no aimless staring at animal after animal on an Activities Abroad holiday to Ranua Wildlife Park! We’ve organised in-depth guided tours with an expert to give you all the information and fascinating facts about the creatures you’ll encounter – here’s one to get you started: the polar bear is the largest living land-based carnivore on Earth! Most of our holidays here feature a special polar bear meet and greet where you can get a closer look at how they are fed. Visit during the festive season and you’ll help staff feed the park animals their Christmas dinner! On all of our trips, tickets will be valid for your whole stay – so you can return to see your favourite animals again and again! Outside the park, you’ll be able to go cross-country skiing on nearby routes and hike into the surrounding woods on snowshoes to find out about the hidden life they contain. In addition, you can learn how to ice-fish on frozen waters – a very popular Nordic practice which will have you hooked too! You might also like to go snowmobiling and certainly won’t want to pass on the chance to head on husky safaris – easily the coolest and most lively way to get around. 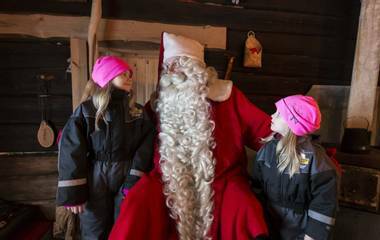 In December, you can help hunt down the perfect Christmas tree and have your own meeting with Santa Claus in his Lapland home. There’s also a massive Christmas feast with specialities from Finland and around the world! Have you ever stood before a polar bear? It’s simply glorious – thick great white coats and massive paws lumbering over snow; not to forget intense black eyes full of wisdom. It’s no wonder author Philip Pullman chose to feature them in his Golden Compass trilogy as a race of intelligent, talking bears! With so many different species available to see, you might feel a little pulled in different directions, but this isn’t some plain old zoo. With a ticket letting you return as often as you like, it’s possible to slow down and take in the animal sights without rushing about. An added bonus of visiting during the colder months is that the animals have their thickest coats of fur, which looks incredibly cool (and keeps them nice and warm!). Should you choose to book our Christmas Ranua holiday, rest assured that your children will have a magical time with the man in red. He’s as kind and friendly as anyone would expect and shares his seasonal stories with one and all. The experience is worlds away from stressful queues in shopping mall grottos!